Once again I will try to write a small tournament report, with both a couple of lines about what I played and also the tournament itself as I am one of the organizers. The tournament this time was named Lucia Legends because it happened the same week as “Lucia”. Lucia is a strange celebration that happens in Sweden and a couple of other countries. It includes a girl with candles in her hair and guys dressed all in white with long pointy hats (they could easily be mistaken for a group of very bad people). We had nothing of the sort, except for a poster with legends with candles in their hair. In the prize pool we had one of the highly sought after invites to n00bcon X, but we were not going to give it to the winner. We had been pretty clear on that part since we announced the tournament as we don’t want too much of a competitive feel at our tournaments. Instead we just told all the players that everyone would have a chance to win the invite, that it would not me a lottery and they would get to know exactly how during the tournament. Do you know the names and casting cost of these legends? Click to enlarge. So how were we going to give out the invite you say? We decided to do a small side competition that were magic related, but didn’t include playing the game. Before the tournament started everyone got a paper with a quiz. The quiz was about legends of course as the tournaments name was Lucia Legends. We had six pictures of legends that hadn’t been reprinted in Chronicles and the players then needed to write down the legends name and also mana cost. The 4 players who got most names right then later got to compete for the invite. It may have been so that we made it a bit hard as two people with only two correct answers got to be among the contestants. 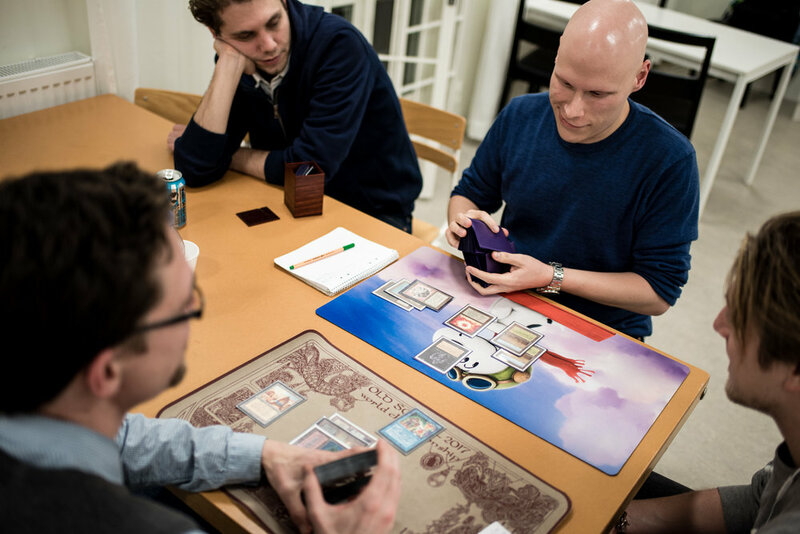 The best one though was Jesper Holm who was playing his first 93/94 tournament with his own deck. He got five rights and also got almost all of the mana costs correct, both CMC and what colors. That was a bit crazy. This was announced after the swiss and the four contestants then got to continue to compete against each other. First Jesper got one point for winning the quiz and the others got to start on zero points. Then it was time for some Falling Star Flippin’! I had placed a bunch of creatures in a pattern on a table and all the contestants then got to flip the star and get one point for every creature they hit. Sorry to say I don’t remember the exact scores here, but Jesper was still in the lead before the last part of the competition. The last part was a quiz where the contestants needed to raise their hand first to answer the questions I asked them. A correct answer gave them one point, but if they answered wrong they got a penalty point. The contestants were Yann Franzén, Svante Landgraf, Jesper Holm and Johan Råberg. Want to try the quiz and some bonus questions? Here it is! Which expansion in order is Legends? Tell me the names of the three different 0/1 Kobolds in Legends? What happens if you have Chains of Mephistopheles in play and play Winds of Change? Which sorcery in Legends have one time been erratad to an Enchantment? There was one big problem with all the booster boxes from Legends, what? Which of the Elder Dragons have the colors White, Green and Blue? How many creatures in Legends have the ability “Bands with others”? How many cards are in a Legends Booster? Gray Ogre has a functional reprint in Legends, what is the name of that card? Name one mechanic except “Bands with others” that was introduced in Legends. Which color didn’t get an Enchant World? What is unique with all the non-basic lands from Legends? After this we had a winner and the winners name was Svante Landgraf. He completely crushed in the quiz and it didn’t even seem fair, but hey, that’s just how it is sometimes. Congratulations Svante! You can by the way read his tournament report from Lucia Legends here. Back to the tournament now! We were a mere 17 people who battled it out and you can find all of their decks here below. Sorry to say I was a bit stressed out both playing, organizing and doing the quiz part (also a bit drunk) so I didn’t really get what everyone was playing so some of the decks miss their pilot and also what position they ended up in. If you recognize one of the decks and know who piloted it, please comment and we will fix it. Top 4 - Yann Franzén - Eureka! Top 8 - Micke Thai - Legends! We played four rounds of swiss with a short pizza break before a top 8. Yes, almost half of the players got too play again, but more magic is always fun isn’t it? I was one of the lucky ones who got to play more and now I’m going to segway into a couple of words about what I played and how I did. I had really started to miss my favorite deck, my beloved UR Counterburn, but I really didn’t want to play it as it is. So the night before the tournament I decided to cut all the creatures and instead put in two main deck City in a Bottle. Overall I took some inspiration from across the pond and made it into a control deck instead of a tempo deck. I played more mana sources and more control oriented cards, I even went down to only 2 Chain Lightning so I could play more cards in instant speed. A couple of the choices were not made because they were the best possible though. They were made because I also put together a deck for my friend Egil so he could play in his first 93/94 tournament ever. That’s why you don’t see the black splash in my deck. Last but not least I needed a wincon and it couldn’t be from Arabian Nights so I went with the ever powerful Mahamoti Djinn and Shivan Dragon. Not the best choices but as with Fork, very fun choices! The Earthquake and Orcish Artillery were there because a lot of players in Stockholm are playing Zoo, White Zoo and more small creatures. It went fairly well (I did top 8 after all) and the deck played as it should most of the time. Except for when I met Yann Franzén on Eureka. This is where I realized I probably should have some more control elements or fast clocks in the sideboard. I don’t think I would have won anyway as Yann was on an amazing roll this day! He steamrolled me because even when I stopped him in the beginning I couldn’t finish the game until he got enough mana to cast every creature he drew. Yann only lost one match the whole day and that was against Egil in the semi final. That was a bit sad as it would have been cool to see Eureka take it down. But the story about the eventual winner was also a really fun story! I also need to point out one of the stupidest things that happened to me during the tournament. I had an opponent on 11 life, played a Braingeyser for four and drew exactly four Lightning Bolts! Crazy. 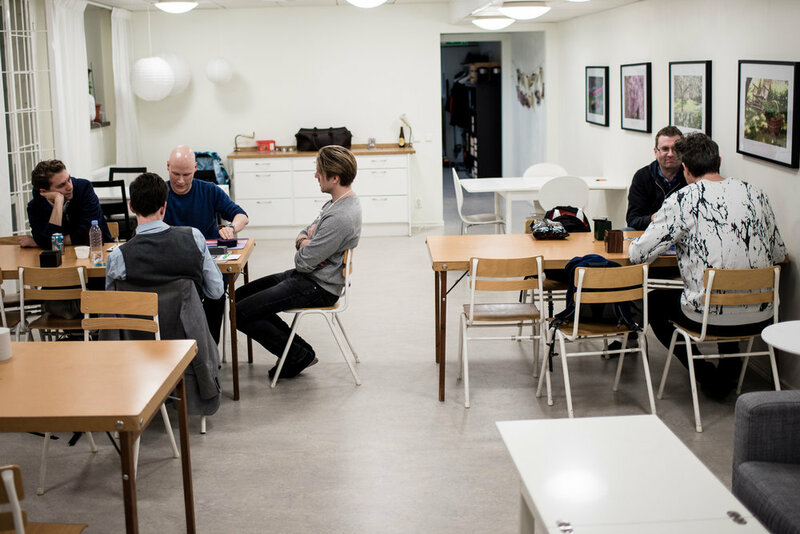 By the way, the top 8 consisted of the players Gordon Andersson, Svante Landgraf, Yann Franzén, Jesper Holm, Egil Salomonsson, Leo Saucedo, Micke Thai and Jocke Falk. Yep, I wore a jacket with turquoise flowers. A happy guy unknowing that he is soon to become a Rag Man. Hmm... I wonder if these are good against Mono Red. Turned out they were! Yes, your Abyss is no more. A successful flip warrants a beer! 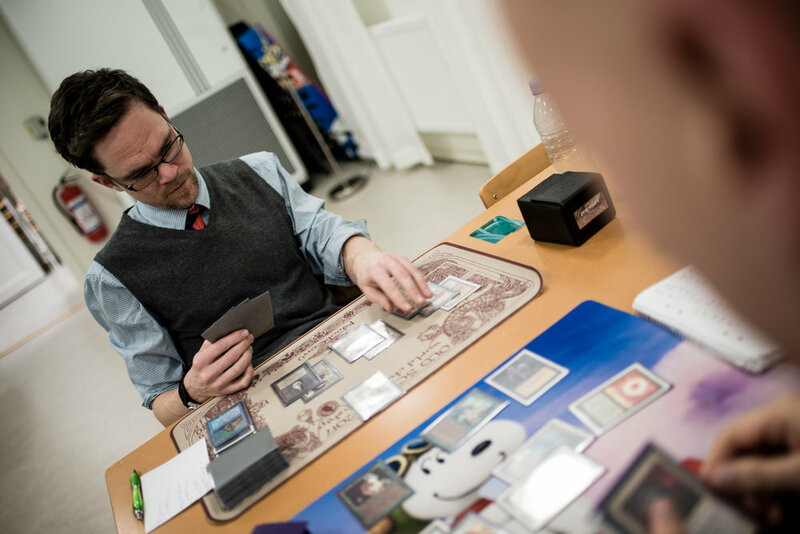 In the quarter final I met Jesper Holm who was on Blue Green Berserk and played it beautifully. He is a former Legacy player who just converted to 93/94 and the play style and expertise to play around removal and counters showed it. The problem was that my deck is probably not the best for him to meet and a slew of bolts and counterspells put Jesper down. The semi final was against the quiz master Svante who played a UWr fliers deck which I thought was built completely different than how it was so me and my drunkenness probably gave him the match. It was a fun and intricate match however. But at least two times I should have slammed one of my big monsters but didn’t as I thought he was playing a bunch of Swords to Plowshares, which he wasn’t. So I scrubbed out. I must however say that I did like the deck and maybe I will play it again, but with a couple of main deck Blood Moon for maximum hate. So Svante who won the quiz also went on to the finals where he met Egil. This was probably the most amazing story of the day as Egil only has dipped his feet in the format before. 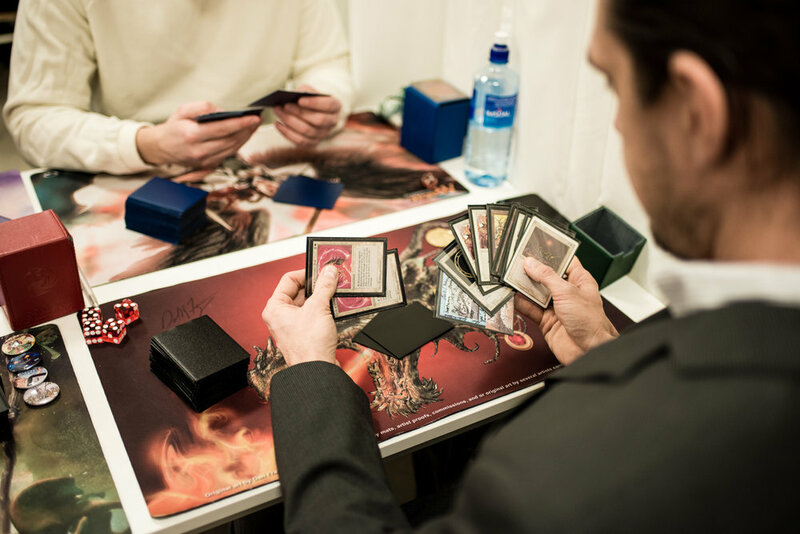 He is however one of the better Legacy players in Stockholm and also a name you can see on net decking sites from online Vintage tournaments. 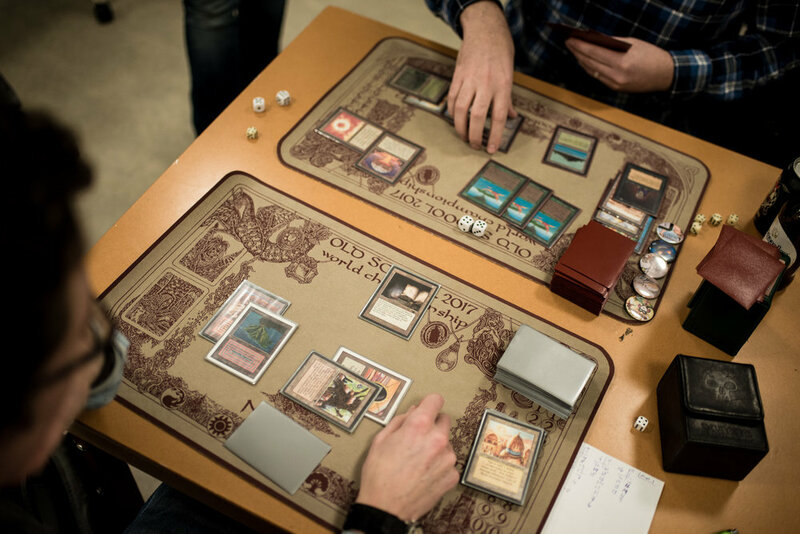 He and I often have heated discussions about the format so I made him play this tournament with a Machine Head deck I put together and he tweeked after he was able to borrow two more Juzam and City of Brass. And as the cherry on top he won the whole tournament after a close match against Svante. I also think it was one of the best ending plays in a long time as Svante didn’t think he was dead and had lethal the turn after Egil won. The reason? Egil had a Berserk which Svante had no idea Egil even played. It really came out of nowhere and that’s always fun to see. The Rag Man of the day. This was my first 93/94-only tournament as I don't own any 93/94 cards. 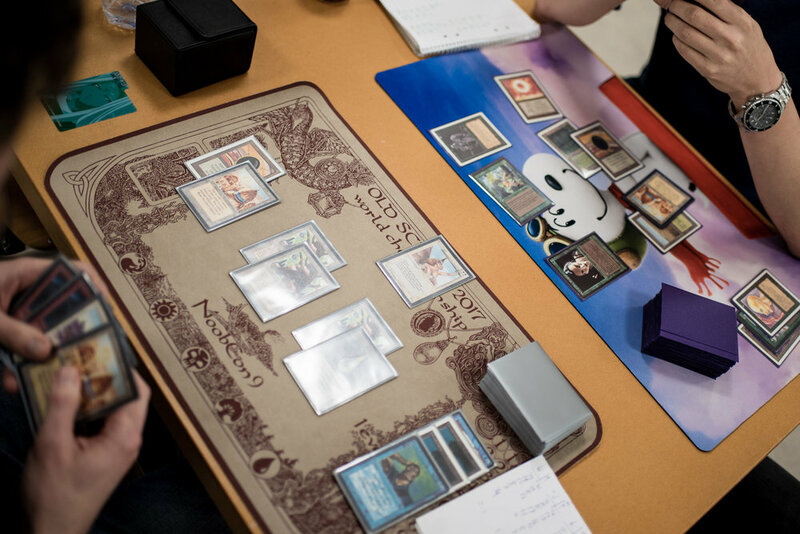 This time however, I was fortunate to be able to borrow a deck and attend the tournament. The people and the atmosphere was amazing and I had a lot of fun the whole day and evening. The deck I borrowed had a very straight forward game plan, I pretty much never had to care about what my opponent was doing (which is very good for me since I knew nothing about the other decks of the format). I presented a large threat by turn 2 or 3 and just continued to deploy them until my opponent was dead. I had to read a lot of cards during the event and it baffled me that cards can have so much text and do so little against Juzams and Erhnamns. I had a game where my opponent played Eureka, which to a Legacy/Vintage player means that you lose to large Yawmgoth's Bargains on legs, but all they had was 5/5s and an 8/8 which did a lot of damage to themselves (thanks for that game, strip mine), just like me! I just had more of them. I would like to thank Gordon and Daniel for this great event and I hope to attend more of these in the future! A playset of Shivans was my fist thought when building this deck. Secondly, I wanted to have creatures with 7 power so that 3 hits would do at least 20 damage (even if Shivan is a 5/5 it can breath fire), that led me to adding the Elder dragons and one Lord of the Pit. Having this many flyers in the deck also turned my eyes to Moat. Because with so many fast creatures like Su-Chi, Mishra and Juazams in the meta I thought it would be a good answer to have in main deck. Since I wanted to have CoP: Red in the SB adding some extra white mana was already on my mind. I ended up going 4-2 in the tournament and here are some of the highlights. My best game was probably in the first match, when I could finish the game with Eureka on turn 3 against w/b prison. I Eurekad out a Concordant Crossroads 2 Shivans, 1 Elder Dragon and 1 Force of Nature which was a bit much for the opponent to handle. The 2 main deck Concordant Crossroads together with 1 in the sideboard seemed enough to be able to break any control deck. As soon as Concordant is out the opponent needs to handle every creature I put into play with instans. Of course, 2 Red Elemental Blast or Divine Offering/Disenchant also helps a bit against control, but what do you take out besides moat? Both of my two losses were actually against the same player, Egil, who also later went on to win the whole tournament. He simply played better than me and I was a bit over confident in one duel which I lost by taking 16 damage from my own Force of Nature after Egil top decked a strip mine to make it impossible for me to pay the GGGG upkeep, but I blame myself for giving him the opportunity to do so. His deck, with so many large creatures and lots of instants like Swords to Plowshares, my Concordants wasn't that effective. Not sure if I should have kept them and also add 2 Avoid Fate for his removal and hope to gather a swing for 20+ before he kills me. I decided to take them out and I lost every game by taking hits from hyppies and fast Djinns. Not having full power yet I was fortunate to borrow a lotus for this day, and I would say that the lotus helped me to win at least 2 games. One game it helped me hard cast Shivan on turn 3, and another game it made it possible to play a Mindtwist after a Time Twister. Since then this has kept me from buying new cards, restraining myself not to buy anything before the crown jewel, Black Lotus. Crimson Kobolds, Crookshank Kobolds, Kobolds of Kher Keep. Both players shuffle their hand into their library and mill that many cards. Zero, there are only cards that grant the ability or create tokens with the ability. They have a unique gold border that hasn't been used on any other cards.